I wish I could do that – seize the time and place no trust in tomorrow. Difficult, though, when that stubborn illusion of personal immortality that gets one through childhood and youth finally yields to a sense of timespan and fragility. And yet, between the jumping-at-shadows bouts of vulnerability when a sudden awareness of the body’s incapacities against the vitality of the consciousness bring gloom, I can still take heart. Yes, I keep forgetting names (and I understand that this is where the mental dereliction begins), but I can think and feel as passionately as ever. Age appears not to have significantly diminished what my headmaster described in the 17-year-old me as ‘an overbalanced sense of justice’. And a powerful sense of a spiritual dimension remains firmly in place alongside a quiet certainty that there is no God. I take great pleasure in the company of my friends; I laugh a lot; I read constantly; I’m writing steadily again; music, in the playing and the listening, continues to excite and move me in equal measure; and I am aware each day that I have much loved family immediately about me or close enough to see and/or hear whose years cover the spectrum from the horizon right up to a shoreline not so very far away from where I stand. “t’s being here now that’s important. There’s no past and there’s no future. Time is a very misleading thing. All there is ever, is the now. We can gain experience from the past, but we can’t relive it; and we can hope for the future, but we don’t know if there is one. The word “now” is like a bomb through the window, and it ticks. 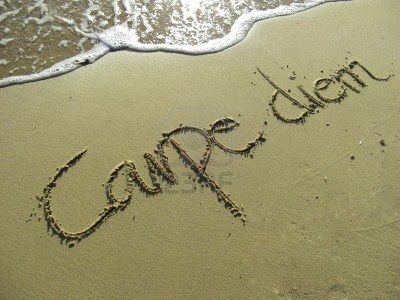 7 Responses to CARPE DIEM QUAM MINIMUM CREDULA POSTERO. Your headmaster reminds me of someone I once worked with who said I had “a naive sense of honesty that would get me into all sorts of trouble” – an oddly disturbing statement, I’ve always thought since. So he saw you as a kind of Candide figure in a wicked world! That comes across as preferable to “he’s a stroppy sod”! And that George Eliot quote rocks. I’m working on bringing it to fruition! I hope not. I’d hate to be the instigator of another’s insomnia! Don’t worry. I can now report that you weren’t, as it turned out.